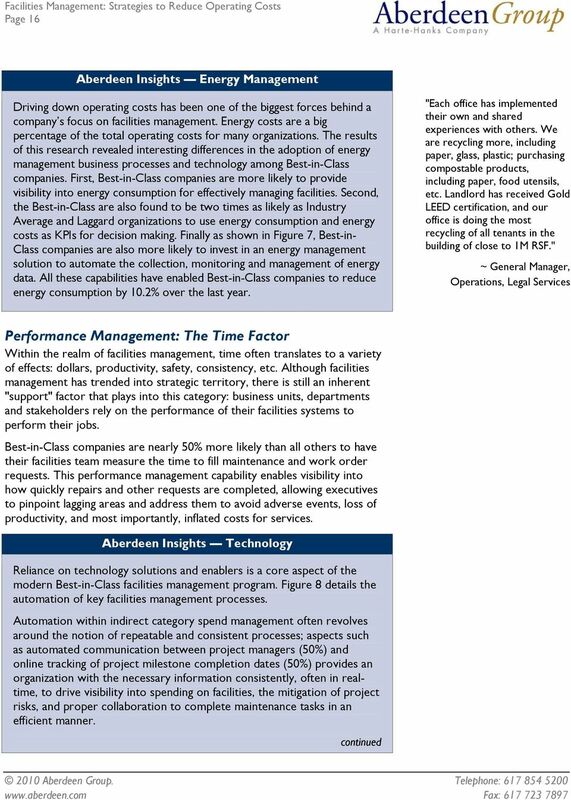 5 Page 5 thinking proves that there is a greater value to proper facilities management, such as lower operating costs for maintenance, work order management, energy consumption and building safety management. 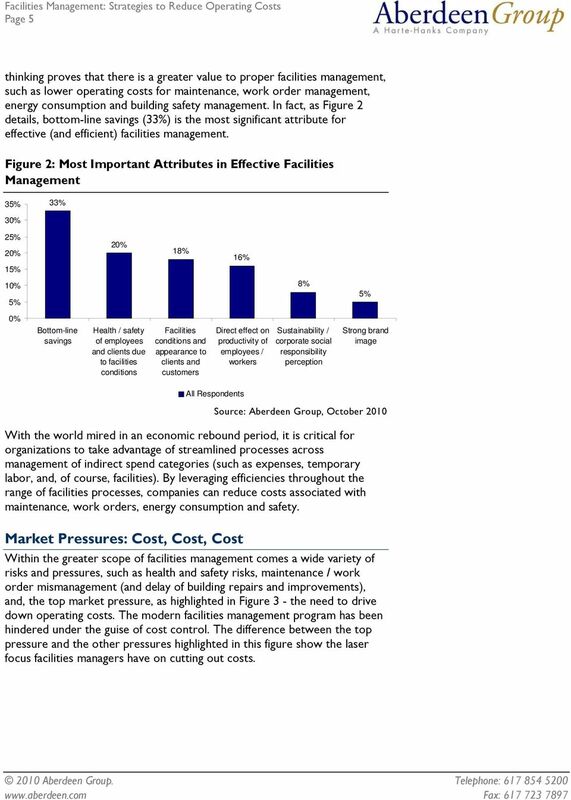 In fact, as Figure 2 details, bottom-line savings (33%) is the most significant attribute for effective (and efficient) facilities management. 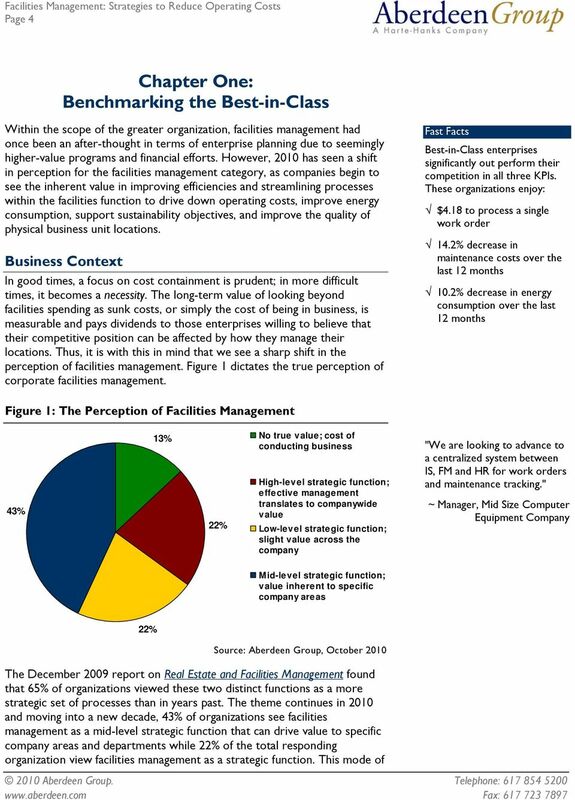 Figure 2: Most Important Attributes in Effective Facilities Management 35% 33% 30% 25% 20% 15% 20% 18% 16% 10% 5% 8% 5% 0% Bottom-line savings Health / safety of employees and clients due to facilities conditions Facilities conditions and appearance to clients and customers Direct effect on productivity of employees / workers Sustainability / corporate social responsibility perception Strong brand image All Respondents With the world mired in an economic rebound period, it is critical for organizations to take advantage of streamlined processes across management of indirect spend categories (such as expenses, temporary labor, and, of course, facilities). By leveraging efficiencies throughout the range of facilities processes, companies can reduce costs associated with maintenance, work orders, energy consumption and safety. Market Pressures: Cost, Cost, Cost Within the greater scope of facilities management comes a wide variety of risks and pressures, such as health and safety risks, maintenance / work order mismanagement (and delay of building repairs and improvements), and, the top market pressure, as highlighted in Figure 3 - the need to drive down operating costs. The modern facilities management program has been hindered under the guise of cost control. The difference between the top pressure and the other pressures highlighted in this figure show the laser focus facilities managers have on cutting out costs. 9 Page 9 finance and customer service groups to work together to ensure that information is shared seamlessly to improve responsiveness. 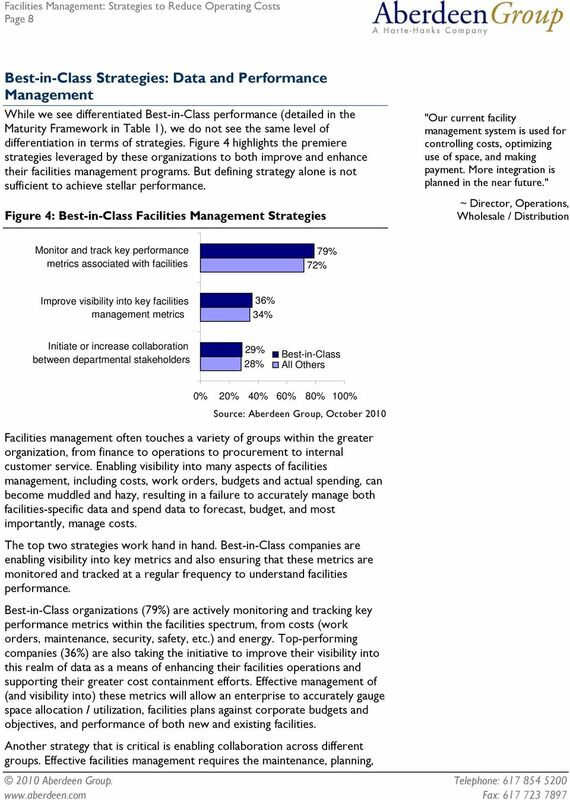 Metrics Aberdeen Group looked into specific metrics that Best-in-Class companies are more likely to measure to benchmark the performance of their facilities management programs. 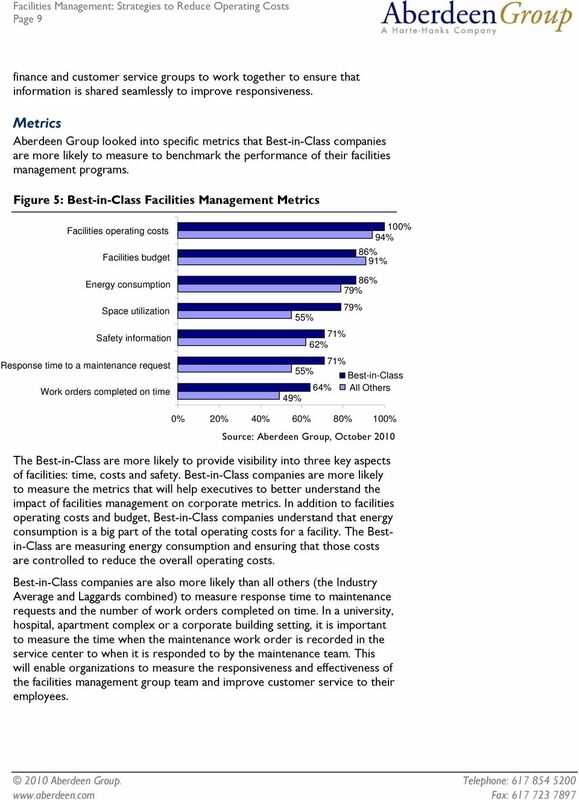 Figure 5: Best-in-Class Facilities Management Metrics Facilities operating costs Facilities budget Energy consumption Space utilization Safety information Response time to a maintenance request Work orders completed on time 49% 55% 55% 71% 62% 64% 71% 100% 94% 86% 91% 86% 79% 79% Best-in-Class All Others 0% 20% 40% 60% 80% 100% The Best-in-Class are more likely to provide visibility into three key aspects of facilities: time, costs and safety. Best-in-Class companies are more likely to measure the metrics that will help executives to better understand the impact of facilities management on corporate metrics. In addition to facilities operating costs and budget, Best-in-Class companies understand that energy consumption is a big part of the total operating costs for a facility. The Bestin-Class are measuring energy consumption and ensuring that those costs are controlled to reduce the overall operating costs. Best-in-Class companies are also more likely than all others (the Industry Average and Laggards combined) to measure response time to maintenance requests and the number of work orders completed on time. In a university, hospital, apartment complex or a corporate building setting, it is important to measure the time when the maintenance work order is recorded in the service center to when it is responded to by the maintenance team. This will enable organizations to measure the responsiveness and effectiveness of the facilities management group team and improve customer service to their employees. 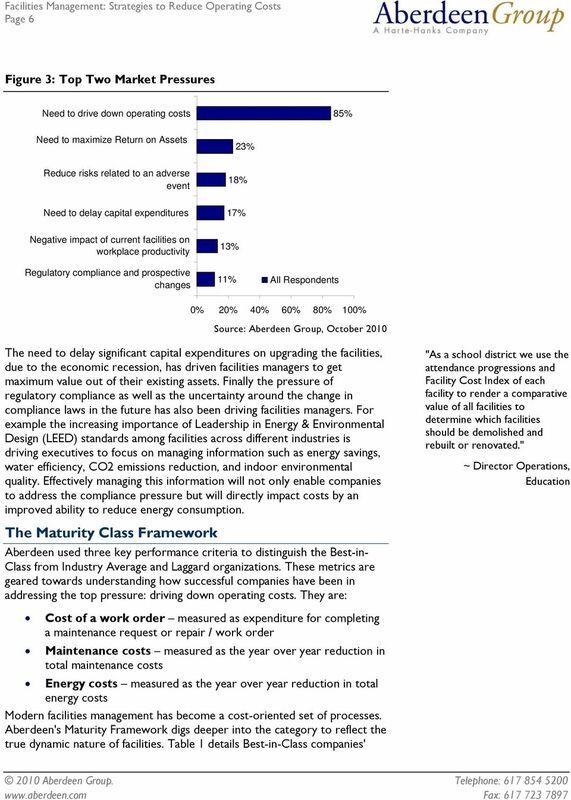 10 Page 10 Aberdeen Insights Top Facilities Management Goals Aberdeen Group found that the top goals (Figure 6) of the facilities management group aligns very much with the key metrics being measured (Figure 5). 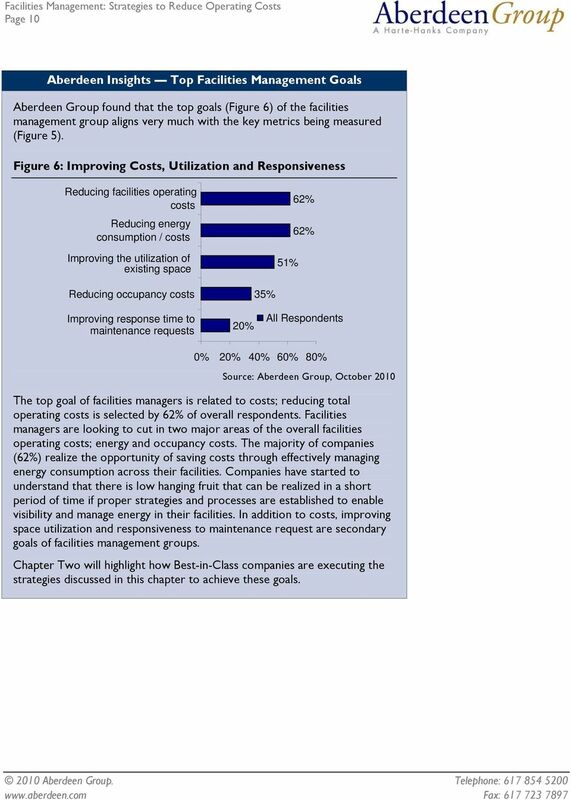 Figure 6: Improving Costs, Utilization and Responsiveness Reducing facilities operating costs Reducing energy consumption / costs Improving the utilization of existing space 51% 62% 62% Reducing occupancy costs Improving response time to maintenance requests 20% 35% All Respondents 0% 20% 40% 60% 80% The top goal of facilities managers is related to costs; reducing total operating costs is selected by 62% of overall respondents. Facilities managers are looking to cut in two major areas of the overall facilities operating costs; energy and occupancy costs. The majority of companies (62%) realize the opportunity of saving costs through effectively managing energy consumption across their facilities. Companies have started to understand that there is low hanging fruit that can be realized in a short period of time if proper strategies and processes are established to enable visibility and manage energy in their facilities. In addition to costs, improving space utilization and responsiveness to maintenance request are secondary goals of facilities management groups. Chapter Two will highlight how Best-in-Class companies are executing the strategies discussed in this chapter to achieve these goals. 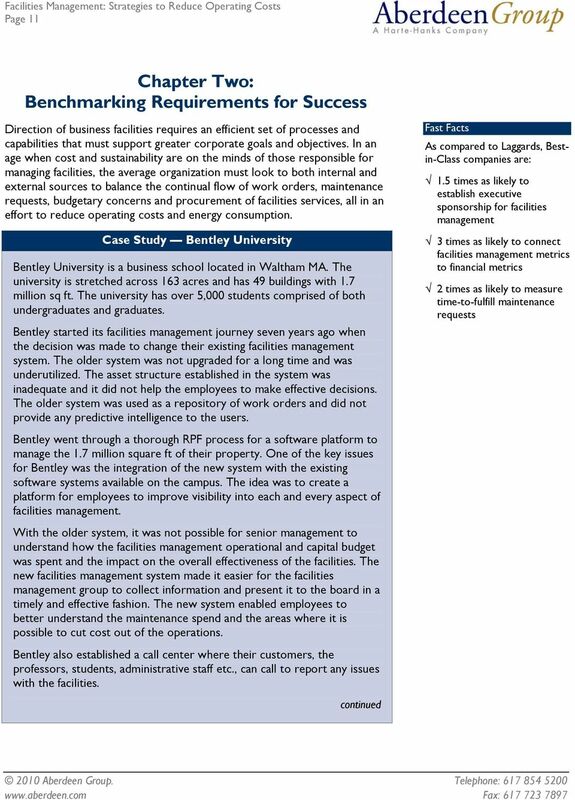 12 Page 12 Case Study Bentley University Once the work order is recorded by the call center it is transferred directly to the distributed control system and is assigned to appropriate employees. Establishing this process increased responsiveness to a work order and helped to improve customer satisfaction. 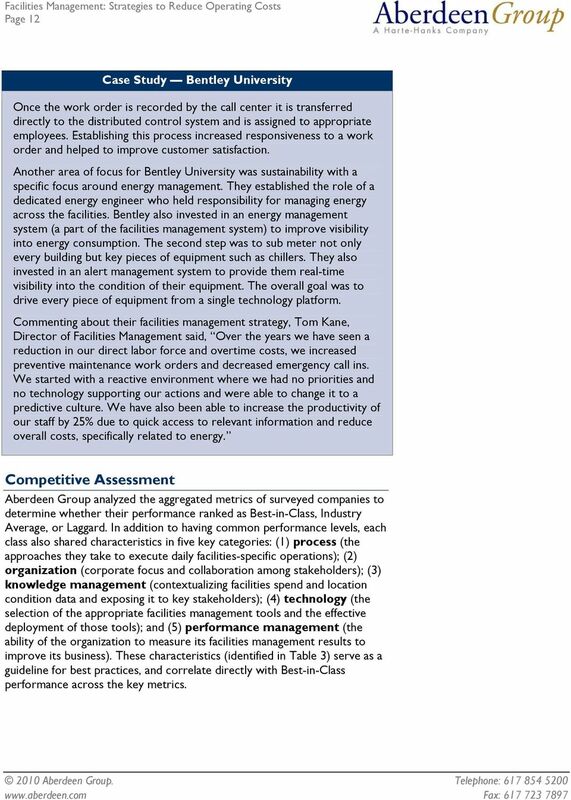 Another area of focus for Bentley University was sustainability with a specific focus around energy management. They established the role of a dedicated energy engineer who held responsibility for managing energy across the facilities. Bentley also invested in an energy management system (a part of the facilities management system) to improve visibility into energy consumption. The second step was to sub meter not only every building but key pieces of equipment such as chillers. They also invested in an alert management system to provide them real-time visibility into the condition of their equipment. The overall goal was to drive every piece of equipment from a single technology platform. Commenting about their facilities management strategy, Tom Kane, Director of Facilities Management said, Over the years we have seen a reduction in our direct labor force and overtime costs, we increased preventive maintenance work orders and decreased emergency call ins. We started with a reactive environment where we had no priorities and no technology supporting our actions and were able to change it to a predictive culture. We have also been able to increase the productivity of our staff by 25% due to quick access to relevant information and reduce overall costs, specifically related to energy. 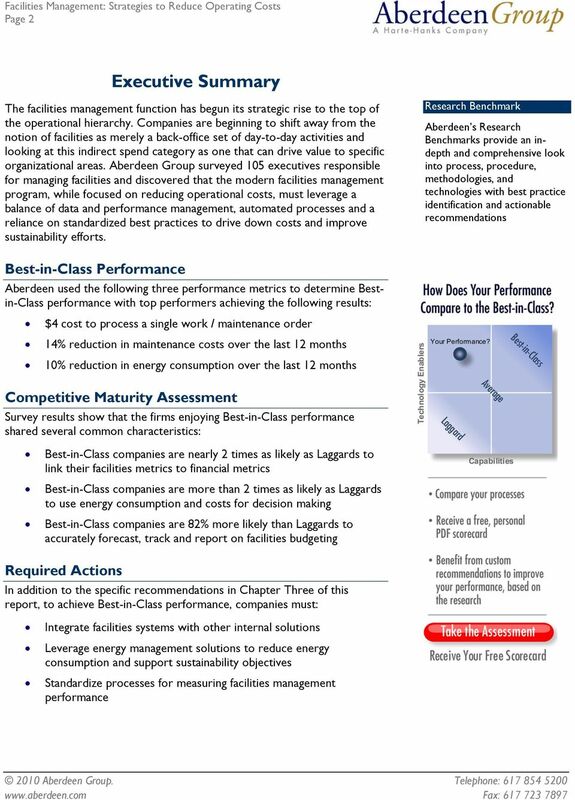 Competitive Assessment Aberdeen Group analyzed the aggregated metrics of surveyed companies to determine whether their performance ranked as Best-in-Class, Industry Average, or Laggard. 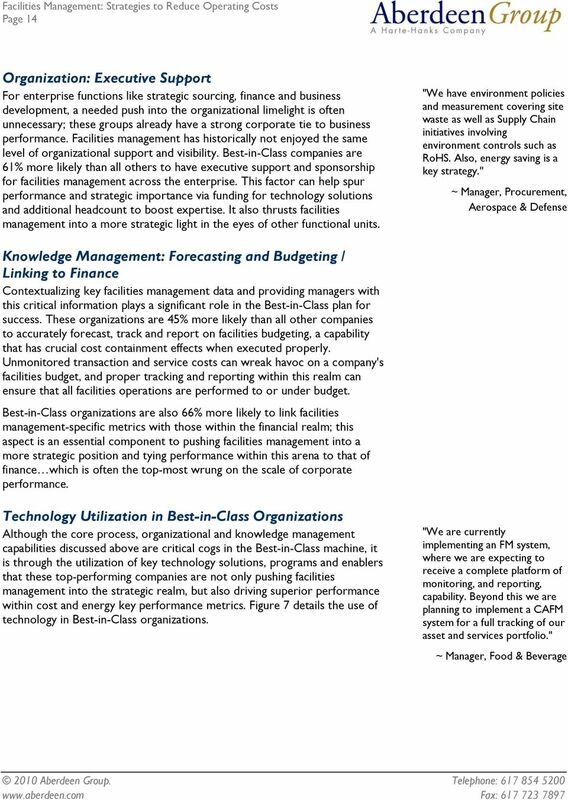 In addition to having common performance levels, each class also shared characteristics in five key categories: (1) process (the approaches they take to execute daily facilities-specific operations); (2) organization (corporate focus and collaboration among stakeholders); (3) knowledge management (contextualizing facilities spend and location condition data and exposing it to key stakeholders); (4) technology (the selection of the appropriate facilities management tools and the effective deployment of those tools); and (5) performance management (the ability of the organization to measure its facilities management results to improve its business). 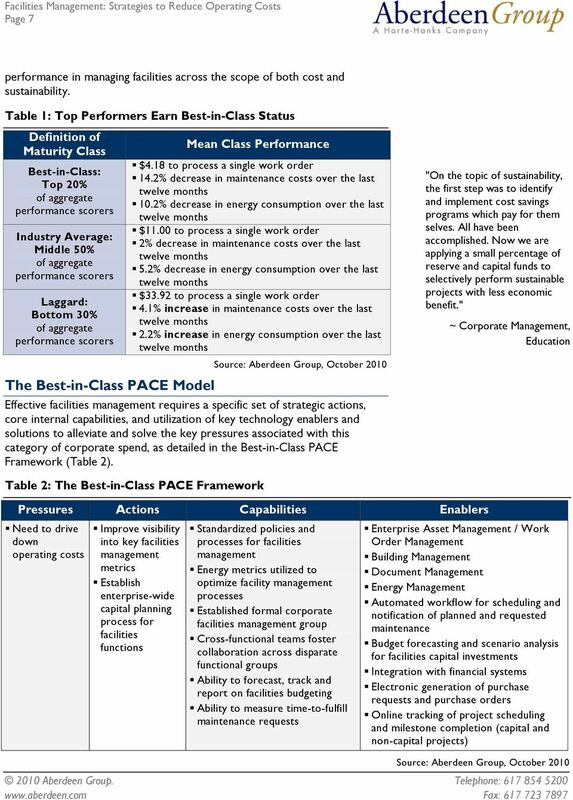 These characteristics (identified in Table 3) serve as a guideline for best practices, and correlate directly with Best-in-Class performance across the key metrics. 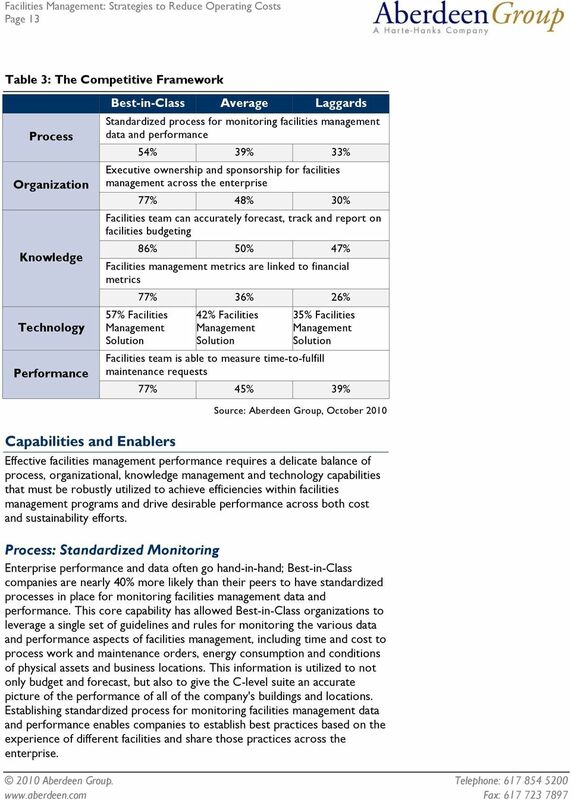 13 Page 13 Table 3: The Competitive Framework Process Organization Knowledge Technology Performance Best-in-Class Average Laggards Standardized process for monitoring facilities management data and performance 54% 39% 33% Executive ownership and sponsorship for facilities management across the enterprise 77% 48% 30% Facilities team can accurately forecast, track and report on facilities budgeting 86% 50% 47% Facilities management metrics are linked to financial metrics 77% 36% 26% 57% Facilities Management Solution 42% Facilities Management Solution 35% Facilities Management Solution Facilities team is able to measure time-to-fulfill maintenance requests 77% 45% 39% Capabilities and Enablers Effective facilities management performance requires a delicate balance of process, organizational, knowledge management and technology capabilities that must be robustly utilized to achieve efficiencies within facilities management programs and drive desirable performance across both cost and sustainability efforts. Process: Standardized Monitoring Enterprise performance and data often go hand-in-hand; Best-in-Class companies are nearly 40% more likely than their peers to have standardized processes in place for monitoring facilities management data and performance. This core capability has allowed Best-in-Class organizations to leverage a single set of guidelines and rules for monitoring the various data and performance aspects of facilities management, including time and cost to process work and maintenance orders, energy consumption and conditions of physical assets and business locations. This information is utilized to not only budget and forecast, but also to give the C-level suite an accurate picture of the performance of all of the company's buildings and locations. Establishing standardized process for monitoring facilities management data and performance enables companies to establish best practices based on the experience of different facilities and share those practices across the enterprise. 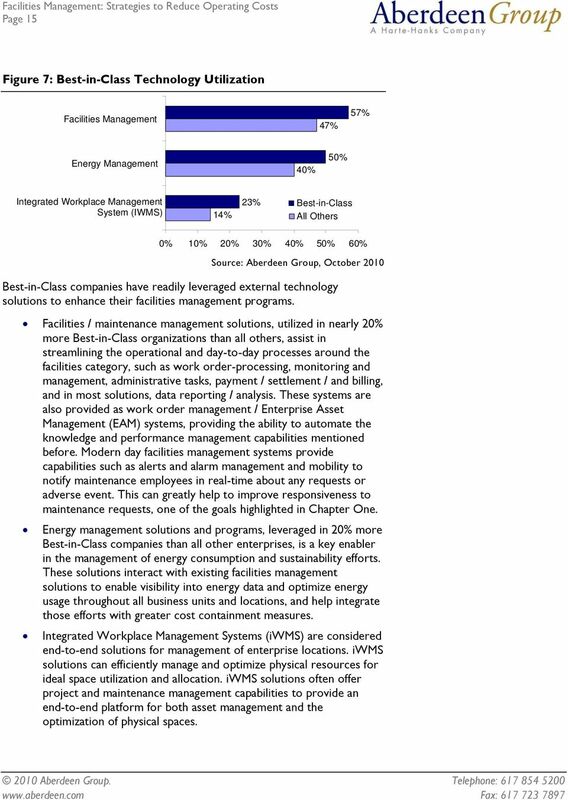 15 Page 15 Figure 7: Best-in-Class Technology Utilization Facilities Management 47% 57% Energy Management 40% 50% Integrated Workplace Management System (IWMS) 14% 23% Best-in-Class All Others 0% 10% 20% 30% 40% 50% 60% Best-in-Class companies have readily leveraged external technology solutions to enhance their facilities management programs. Facilities / maintenance management solutions, utilized in nearly 20% more Best-in-Class organizations than all others, assist in streamlining the operational and day-to-day processes around the facilities category, such as work order-processing, monitoring and management, administrative tasks, payment / settlement / and billing, and in most solutions, data reporting / analysis. These systems are also provided as work order management / Enterprise Asset Management (EAM) systems, providing the ability to automate the knowledge and performance management capabilities mentioned before. Modern day facilities management systems provide capabilities such as alerts and alarm management and mobility to notify maintenance employees in real-time about any requests or adverse event. This can greatly help to improve responsiveness to maintenance requests, one of the goals highlighted in Chapter One. Energy management solutions and programs, leveraged in 20% more Best-in-Class companies than all other enterprises, is a key enabler in the management of energy consumption and sustainability efforts. These solutions interact with existing facilities management solutions to enable visibility into energy data and optimize energy usage throughout all business units and locations, and help integrate those efforts with greater cost containment measures. Integrated Workplace Management Systems (iwms) are considered end-to-end solutions for management of enterprise locations. iwms solutions can efficiently manage and optimize physical resources for ideal space utilization and allocation. iwms solutions often offer project and maintenance management capabilities to provide an end-to-end platform for both asset management and the optimization of physical spaces. 17 Page 17 Aberdeen Insights Technology Automated communication enables project managers to tap into a centralized system and easily extract information in regards to both current facilities spending and ongoing improvement projects. Figure 8: Automation of Facilities Management Processes Electronic generation of purchase requests and purchase orders 47% 62% Automated and centralized communication with project managers 26% 50% Online tracking of project scheduling and milestone completion 36% 50% Budget forecasting and scenario analysis for facilities capital investments 39% 50% 0% 10% 20% 30% 40% 50% 60% 70% Best-in-Class All Others The automation of budget forecasting (50%) is a crucial measure; a company's facilities and locations are often significant investments. 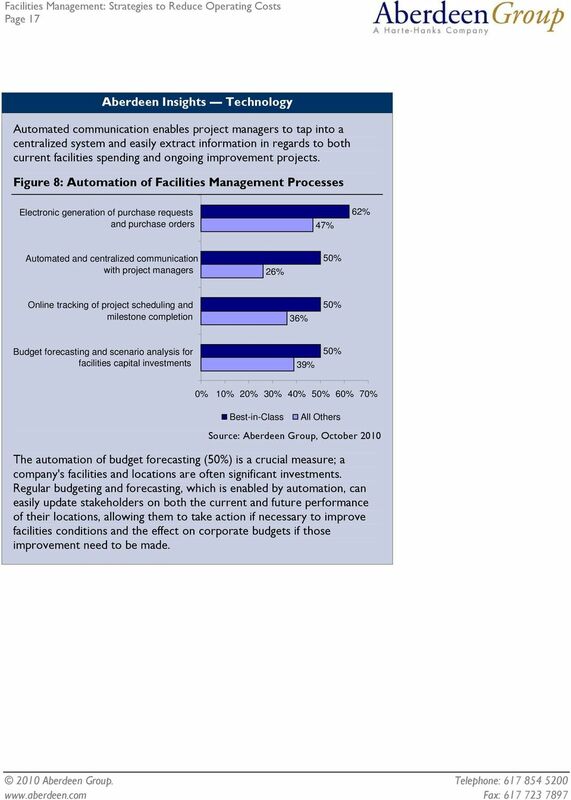 Regular budgeting and forecasting, which is enabled by automation, can easily update stakeholders on both the current and future performance of their locations, allowing them to take action if necessary to improve facilities conditions and the effect on corporate budgets if those improvement need to be made. 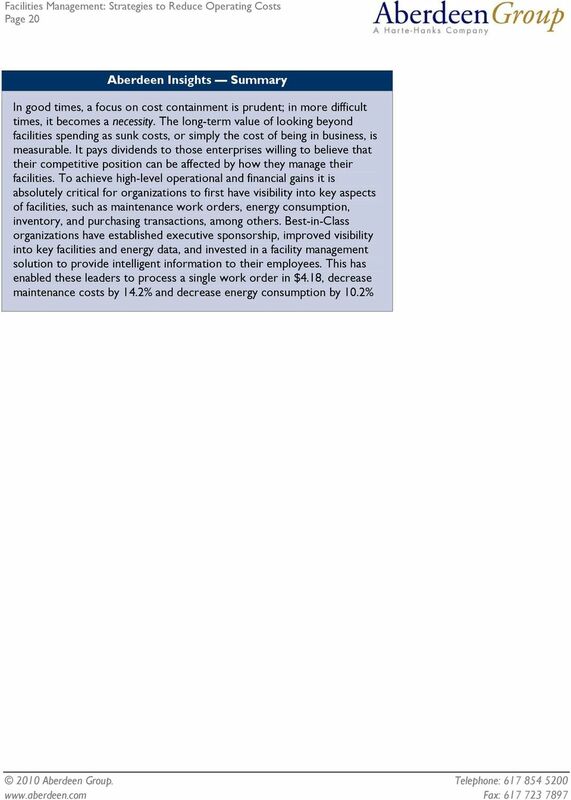 19 Page 19 and the ability to understand energy consumption patterns is critical in controlling those costs. Industry Average organizations should invest in energy management solutions to provide visibility into key energy metrics to their employees as well as executives, and use that visibility to optimize day to day operations. Energy management solutions and programs are leveraged in 20% more Best-in-Class companies than all other enterprises. Improve responsiveness to maintenance work orders by providing real-time information to the facilities maintenance group. In a big facility it can be difficult to respond to maintenance requests in a timely fashion if the information is not sent to the maintenance employees in real-time. Industry Average companies need to invest in a facilities management solution with functionalities such as mobility and alert management systems to provide employees with real time visibility into work orders. Only 42% of Industry Average companies have currently invested in a facilities management system. This will also enable employees to prioritize work orders based on the severity of the requests. 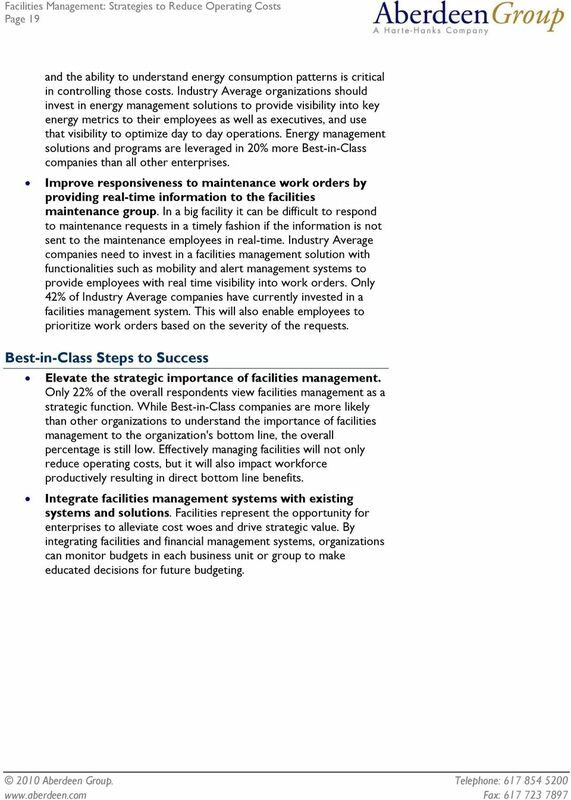 Best-in-Class Steps to Success Elevate the strategic importance of facilities management. Only 22% of the overall respondents view facilities management as a strategic function. 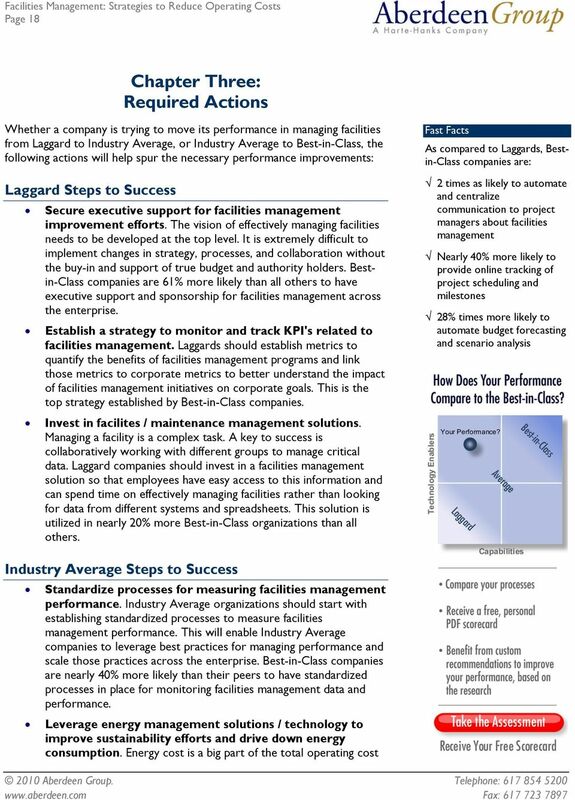 While Best-in-Class companies are more likely than other organizations to understand the importance of facilities management to the organization's bottom line, the overall percentage is still low. Effectively managing facilities will not only reduce operating costs, but it will also impact workforce productively resulting in direct bottom line benefits. Integrate facilities management systems with existing systems and solutions. Facilities represent the opportunity for enterprises to alleviate cost woes and drive strategic value. By integrating facilities and financial management systems, organizations can monitor budgets in each business unit or group to make educated decisions for future budgeting. 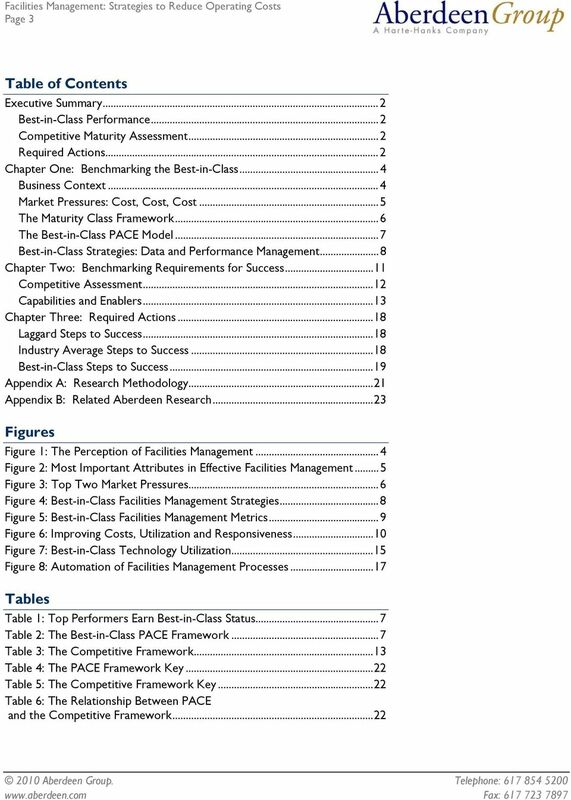 22 Page 22 Table 4: The PACE Framework Key Overview Aberdeen applies a methodology to benchmark research that evaluates the business pressures, actions, capabilities, and enablers (PACE) that indicate corporate behavior in specific business processes. These terms are defined as follows: Pressures external forces that impact an organization s market position, competitiveness, or business operations (e.g., economic, political and regulatory, technology, changing customer preferences, competitive) Actions the strategic approaches that an organization takes in response to industry pressures (e.g., align the corporate business model to leverage industry opportunities, such as product / service strategy, target markets, financial strategy, go-to-market, and sales strategy) Capabilities the business process competencies required to execute corporate strategy (e.g., skilled people, brand, market positioning, viable products / services, ecosystem partners, financing) Enablers the key functionality of technology solutions required to support the organization s enabling business practices (e.g., development platform, applications, network connectivity, user interface, training and support, partner interfaces, data cleansing, and management) Table 5: The Competitive Framework Key Overview The Aberdeen Competitive Framework defines enterprises as falling into one of the following three levels of practices and performance: Best-in-Class (20%) Practices that are the best currently being employed and are significantly superior to the Industry Average, and result in the top industry performance. Industry Average (50%) Practices that represent the average or norm, and result in average industry performance. Laggards (30%) Practices that are significantly behind the average of the industry, and result in below average performance. In the following categories: Process What is the scope of process standardization? What is the efficiency and effectiveness of this process? Organization How is your company currently organized to manage and optimize this particular process? Knowledge What visibility do you have into key data and intelligence required to manage this process? Technology What level of automation have you used to support this process? How is this automation integrated and aligned? Performance What do you measure? How frequently? What s your actual performance? Table 6: The Relationship Between PACE and the Competitive Framework PACE and the Competitive Framework How They Interact Aberdeen research indicates that companies that identify the most influential pressures and take the most transformational and effective actions are most likely to achieve superior performance. The level of competitive performance that a company achieves is strongly determined by the PACE choices that they make and how well they execute those decisions.